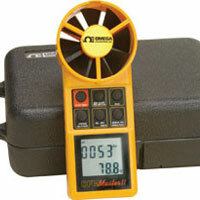 More information about how an anemometer works in this link. OMEGA’s HHF92A rotating vane anemometer measures air velocity in imperial or metric units, including ft/min, mph, knots, metres/sec and km/h. It also displays temperature in °F or °C and has min/max/avg air velocity readings. A handy additional feature is the ability to enter a cross-sectional area value as a multiplier and the unit will then display volumetric flow in either cubic metres per second (cms) or cubic feet per minute (cfm). Note: Kit includes: Hard carrying case, 9 V battery and operator’s manual.